In the spring of 2000, Acadien Cajun Band was created with the intention and the will to carry the tradition one step further. Unlike the typical cajun and zydeco band, relying on standard sounds was not one of the band’s primary objectives. Ryan Simon, the band’s founder and guitarist/accordionist, states that “we are, and have always been for that matter, a band that relies on each other for our initiave and our sound. We are fundamentally traditional in what we play, whether it be standard tunes or not, yet we aspire to be ‘originally challenged'” “Originally Challenged” as Ryan puts it, is the ever-present aspect that defines the band. Since the band first started playing venues and festivals, the main objective has been originality. The culmination of that can be seen on their latest release All Night Long, which is described in more detail on the discography page. Another measure the band takes in their approach to performing is the songs themselves. Despite the original tunes the band plays, the majority of its repertoire is tradition music. Ryan states, “We sound the best when we learn from each other. What really drives us is when we don’t have to listen to records or cd’s. That’s when we become original, even if it is with standard tunes.” “For example, we might play a traditional two fiddle two-step. We might just play it accoustically if one of us thinks its sounds better.” “Each of us, moreover, is an encyclopedia of Cajun music in his own right. We each have different influences that we teach the others, whether it be songs or styles that help contribute to our sound. From the age of fourteen, Ryan’s fascination and passion for his culture has culminated in the present day flare for the band’s beginnings and evolution. Born and raised in Judice, LA, Ryan started learning the Cajun French language as a teenager from his family. As time progressed, this love begot another, Cajun music. His musical influence helped him strengthen his linguistic ability, and he soon found that the opposite would be true. He started learning accordion on his own at age 18, and by 22 learned to play 5 different instruments. In 2000, Ryan, along with then guitarist Dwayne Michaud, created a band that would be the same yet different. A band that would be traditional yet contemporary. He started Acadien in order to write original Cajun songs, give style to the music by revitalizing old songs, and just having a great time playing, living and breathing his culture. His influences, including people such as Steve Riley, Marc Savoy, Dewey Balfa, and his grandfather Nolan David, have helped to mold his distinct and original approach to Cajun music and to Acadien. Hailing from Ossun, LA, Dwayne has been playing music professionally for over twenty years. Ryan and Dwayne first started Acadien in 2000 after working together at Vermilionville, a living history museum of Cajun/Creole culture in Lafayette, LA. Actually better known for as a bassist, Dwayne has played with numerous musicians over the years including Howard Noel, Jr., Ulyesses Poirrier, and the late great Aldus Roger. He fills in the rhythm section with Jay and Joe, adding not only syncopated guitar rhythms, but his own unique vocal ability. A native of Iota, LA, Joe is one of the newest members to Acadien Cajun Band, since the spring of 2006. Joe’s precise and expert knowledge and understanding of Cajun bass and rhythm, as well as his overall awareness of Cajun music adds an excellent bass line to Acadien’s truly unique rhythm section. He adds his own unique personality to Acadien, and his dancehall style complements the driving sound of both the rhythm and drum sections of the band. Besides a bassist, Joe is an accomplished guitarist as well. He is also an employee full time at Bon Petite Cajun Accordions in Iota, run by famed accordion maker Larry Miller. Hailing from downtown Iota, LA, Jay Miller rounds out the all-too-critical drum section of Acadien. Jay has been around Cajun music nearly all of his life, thanks to related to Larry, Blake, and the rest of the Miller family. Jay is a talented drummer, taking his liking to Cajun drums from people like Kevin Dugas, Todd Aucoin, and, of course, Drew Simon. His sharp timing, studious rhythms, and detailed understanding of the Cajun repertoire make him the ideal Acadien drummer. As well as a musician, Jay is also very involved in the French culture of south Louisiana, having made numerous trips to Nova Scotia to study at St. Anne’s University, as well as a number of trips to Augusta West Virginia to play music. Although the 2nd anniversary of Katrina’s slam-bang of Southern Louisiana has passed, the area is still very much in the news and in the thoughts of a lot of people — not only those who still live there, but many others who have spent time in the area and retain fond memories. With that in mind, it seemed to me to be a good time to simply recognize some practitioners of one of the area’s signature musical styles, one that always livens up the mood. Cajun music is our subject, and more specifically, the Acadien Cajun Band’s new album, All Night Long, due out soon on the Swallow Records label. This is the group’s second album, following their debut, 2004’s La Clarite. Ryan Simon, the founder of the band and the guy manning the squeeze-box, handles many of the vocals, including the title song (which he also composed) a bouncing, driving tune that perfectly defines the genre. The rest of the group includes fiddler Brandon Moreau, guitarist Dwayne Michaud, Joe Romero on bass, and drummer Jay Miller. They’re also joined by a couple of guest artists, Ryan’s brother Drew Simon, who is a well-known Cajun singer and musician in his own right, and second fiddler Robin Bruck. Drew, who is normally a part of the Pine Leaf Boys, shows his vocal style – typically Cajun – on “I’m Not To Blame,” a slow ballad evocative of lost love. In addition to the title tune, brother Ryan shows up well on “Nonc Charlot”, leading with his fiddle, and again on “One Time Too Many.” If you’re into dancing that song will do the job, but I especially enjoyed “Cankton Two Step,” a piece that’s impossible to resist. 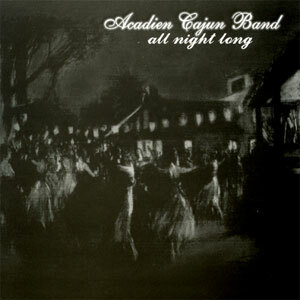 Good stuff, coming our way direct from the bayou, the Acadien Cajun Band’s All Night Long. 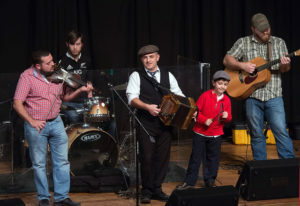 The fact that the Acadien Cajun Band gave its name a French spelling is an indication that this young Cajun band, which has been together seven years, wants to connect with its cultural roots. This is also apparent in the repertoire, which included four Dewey Balfa songs, as well as one by his brother Rodney, a few by Dennis McGee, and a couple that are traditional. The band updates the material by using electric guitar on some tracks, and multi-instrumentalist Ryan Simon brought along his brother Drew (Pine Leaf Boys) to sing lead on “Lake Charles Twp Step” and to add some extra drumming to the ensemble sound. The album ends with the title track, one of two Ryan Simon originals. The Acadien Cajun Band hasn’t reached the level of the Pine Leaf Boys yet, but All Night Long, the group’s second album (first on the Swallow record label), shows a lot of promise.